In the never ending battle to keep my weight down, I have cut out the carbs in my breakfast. I could eat a egg sandwich for breakfast everyday of my life and be happy but cutting back a little at each meal is going to help me in the long run. Eggs and vegetables are on the menu now. Hold the toast, hide the rolls, even the lowly tortilla wrap isn’t welcome on the breakfast table anymore. Here’s some of the ways that I make a scrambled egg bowl. Scrambled eggs are great. They’re easy to make and taste good. But by themselves, they’re aren’t going to satisfy my hunger enough to make it to lunch. Don’t you hate it when you pack a lunch for work and you eat it before 10:00 am? I do love eating vegetables. So why not add them together with eggs in a scrambled egg bowl. The bowl in the scrambled egg bowl really doesn’t matter. You can eat them on a plate and they would taste exactly the same. I think that some paleo bloggers or fitness people started calling them scrambled egg bowls instead of just scrambled eggs that you eat in a bowl. It sort of became a thing. Kind of like oatmeal in a jar. You can make oatmeal without a jar but the jar is the gimmick. With scrambled egg bowls the bowl is the gimmick. Sure that sounds like an explanation from an angry old man but I’m angry because I’m so hungry all the time. The bowl does make a little bit of a difference for me mentally. Having good looking, brightly colored food is definitely more satisfying that something quick that you eat while standing over the sink. And you know the rule about eating something while standing over the sink right? None of those calories count. It’s sort of like when a tree falls in the woods but no one is around to hear it, does it make a sound? If I eat something quick enough while standing in front of the sink there’s a good chance my wife won’t see me eating. And if she doesn’t see me eating then it never happened. The key to scrambled eggs in a bowl is to make the extras first. Have all of them cooked and ready to go and then scramble your eggs last. If you cook your eggs first and put them aside to get cold and nasty, then you won’t be a fan of these scrambled egg bowls. Chop the vegetables first, then cook them, then scramble your eggs last and it’ll be a much more appealing meal. There’s nothing worse than cold eggs. But I’d still probably eat cold eggs at the sink, just don’t tell me wife. 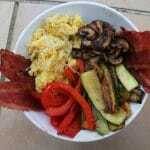 Scrambled Egg Bowl with grilled Red Peppers, zucchini and mushrooms. 1 Red Bell Pepper Yellow or Orange bell peppers are fine too. Green peppers are a little rough for breakfast. 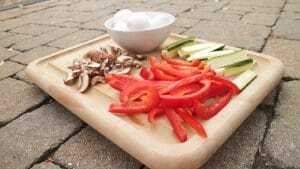 Slice peppers, mushrooms and zucchini. If using onion, slice it also. Add olive oil to a pre-heated frying pan and add peppers, mushrooms and zucchini. Season with salt and pepper. Cook for 5-10 minutes until desired firmness of the vegetables has been reached and set aside. Crack 2 eggs into a bowl and beat with a fork or a hand mixer. Spray a preheated frying pan with cooking spray and pour egg mixture in. Lightly scrape the pan with a spatula to form curds. Continue doing this until the eggs are no longer in liquid form (2-5 minutes). 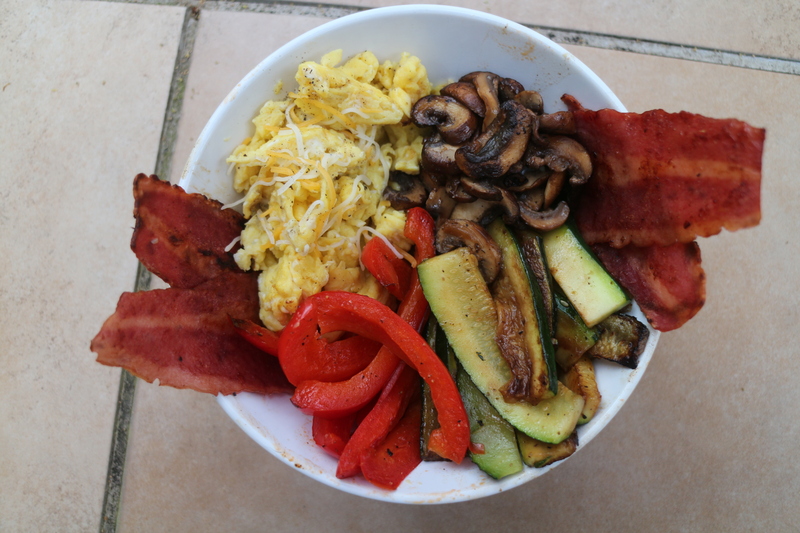 Add eggs, bell pepper, mushrooms, zucchini, onion (optional) and bacon to a bowl. Top eggs with shredded cheddar cheese. Salt and pepper to taste. Note: Large batches of vegetables can be prepared in a grill basket on the BBQ and stored in the fridge for about a week. The vegetables will have nice char to them when cooking on a BBQ. When ready to use, reheat the grilled vegetables in a frying pan before scrambling the eggs. This is especially helpful when you don't have time during the week before work or school to grill the vegetables. Reheating in a frying pan will only take a few minutes.